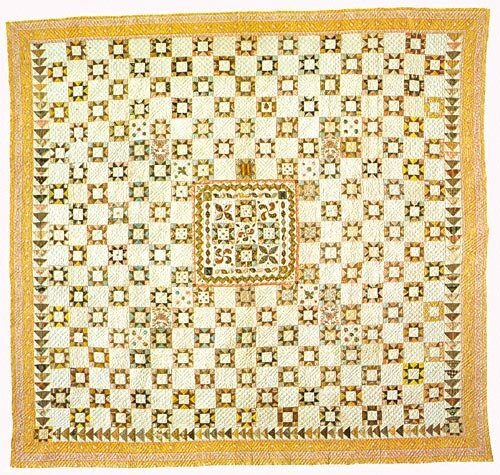 Completed in 1826, this charmer is a spectacular example of an early 19th century scrap quilt. The center medallion (20" square) that 14 year-old Sarah pieced into the quilt center would make a charming wallhanging in and of itself. The original measures 90" square, but it's an heirloom in any size you make it. The Sarah Johnson Quilt will be timeless in its beauty. Quick piecing and hand methods are given for the 4" Variable Star quilt. Illustrations of her actual Signature Block are included along with a special label. The border and wording of the numbered and dated Certificate of Documentation is actually a reproduction of a researched document of the time period. The quilting and applique stencils are included in the pattern.